How I can repair Samsung S3 when I havent screen in mobile . There is only logo Samsung - HEAD UP , look picture. Can you enter recovery mode? Sorry answer late I was sick. I cannot start recovery mode . When I start recovery mode is going only logo in the picture. I can start only Download mode. Download your newest firmware afresh from sammobile.com and flash it with Odin. If it succeeds, start recovery and do FactoryReset. If not, flash a 3part-pit with Odin. I did newest firmware again . After this I have only the same screen / black/ and logo Samsung HEAD UP , look picture. Reset I cannot do . Recovery mode I cant start in. If not, flash a 3part-pit with Odin. --- What is it? How can I do it? This is 3part-firmware (not official) to restore your partitions. All your data will be gone. Search for files and tutorial for your country. Otherwise take this rescue-set. Choose 4.3-version. If it doesn't contain the pitfile, pull it from 4.1.2-zip. If your phone boots afterwards, flash the actual firmware of your country. I did firmware 4.3 and 4.1.2 too. ODIN wrote me PASS . But S3 not restart . When I was restart ,ewerything is the same like before. One last idea: Arter's low format. Otherwise I guess broken hardware. Do you refer to any of my advices? Thank you for help. I learned how I can repair Samsung and how use ODIN and ather software. 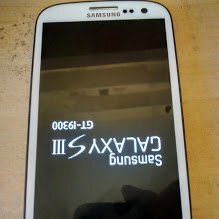 ANOTHER WAY to RECOVERY MODE on S3 ? Now I know I have to find Another way to open Recovery Mode on Samsung Galaxy S3. Is there a local workshop?